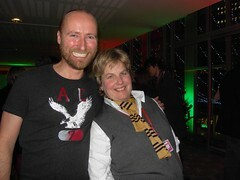 Matt organised tickets for us to see Sandi Toksvig's Christmas Cracker at the Royal Festival Hall last night. Oh dear. Not so much a cracker as a damp squib. We were laughing 'at' not 'with'. Over-long and half-baked. Sandi Toksvig is funny. But this certainly ain't. A rag bag of singers, lame jokes, a 3rd rate magican, a piss-poor send up of a Christmas Carol - and terrible lighting cues and crap sound didn't help. Stephen Mangan was tragically misused as Scrooge. Even Ronnie Corbett and his dated jokes couldn't resuscitate this dying turkey. Word to the wise: at after-show party... gush! Thesbians have uber fracile egos. Saying "that was crap" doesn't go down well!